Michael Berry and I went railfanning on Saturday September 3rd. Michael is from Montreal and wanted to experience Winnipeg's railfan scene. In part 1 we went to CN's Diamond. Prairie Dog - this way! Michael and I left Diamond and headed north on the Perimeter Highway to see the Prairie Dog Central's steam train depart. They have numerous excursions from their station and each trip has a theme. 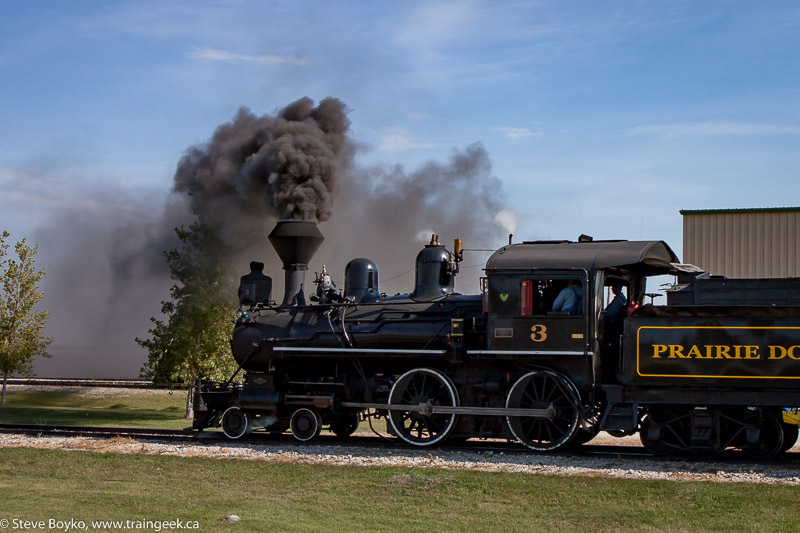 You can always see what's coming up by going to https://tickets.pdcrailway.com/ and they even indicate whether it will be steam or diesel pulling the train. This time it was a steam train, good old #3 ready to haul the ancient coaches to Grosse Isle and back. They had a long train this trip, with the normal four coaches 104-107, combine 103, the caboose, and even bunk car #110 behind the locomotive for some reason. They have to have a "buffer car" between the steam locomotive and any passenger car, but normally the combine (seen above behind the water tank) provides that function as it doesn't carry passengers. I saw from other photos taken this day that the steam engine and #110 were turned together on the wye in Grosse Isle, so maybe the caboose was occupied and they needed 110 as the buffer when they headed back from Grosse Isle. 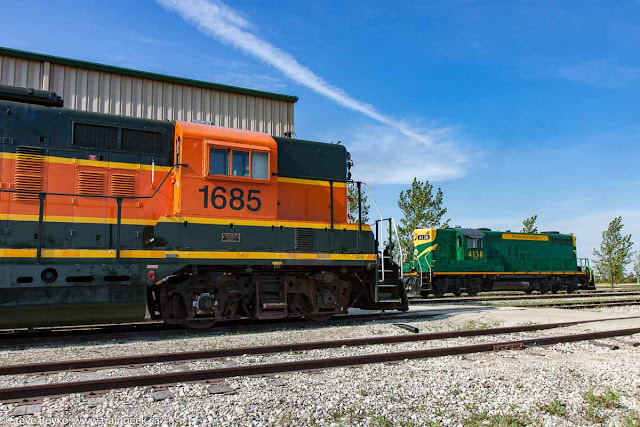 While we were waiting for the train to leave, we photographed some of the other equipment in the yard. 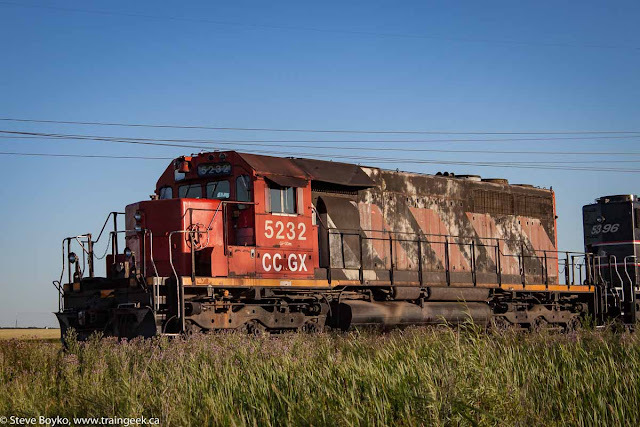 The PDC acquired ex CN SD40 #5232 from the Central Manitoba Railway in the spring of 2015. At that time it was in a faded CN "sergeant stripe" scheme. It was repainted this summer into a classy black and white scheme and this was the first time I had seen it in its new.. "colours" isn't the right word... in its new paint scheme. 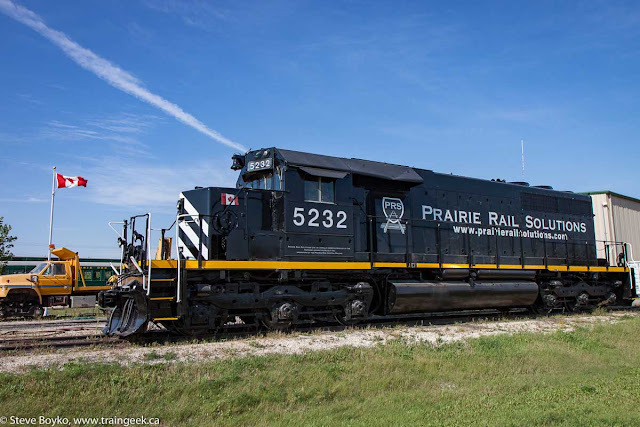 It's now VLSX 5232, labelled for Prairie Rail Solutions, which is the freight arm of the Prairie Dog Central and handles car storage and other railway services. 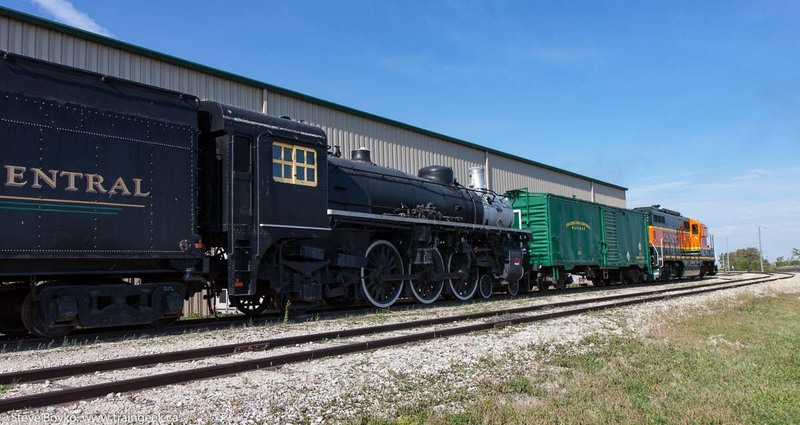 Both the PDC and PRS are owned by the Vintage Locomotive Society, which is where the VLSX reporting mark comes from. Both are ex CN SD40s. NBEC/CFMG removed the snow shields behind the cab and made some changes to the filters and doors to try to reduce snow ingress into the body. You can also see that 5232 still has her class lights above the number boards while 6907 did not. For comparison, here's CCGX 5232 in July 2014. 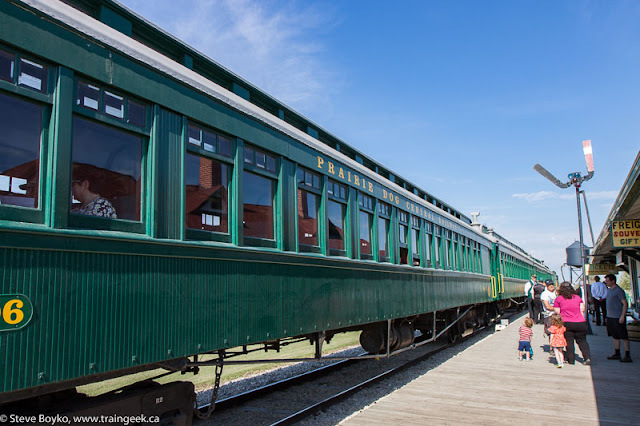 By the way, the fine print under the cab window of 5232 says "Prairie Rail Solutions is a wholly owned subsidiary of the Vintage Locomotive Society Inc. 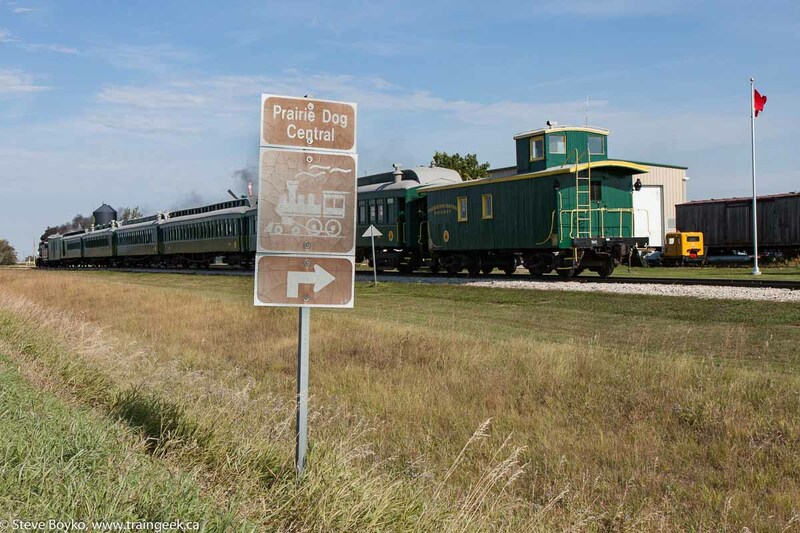 Operators of the Prairie Dog Central Railway". Anyway, tangent over - for now. 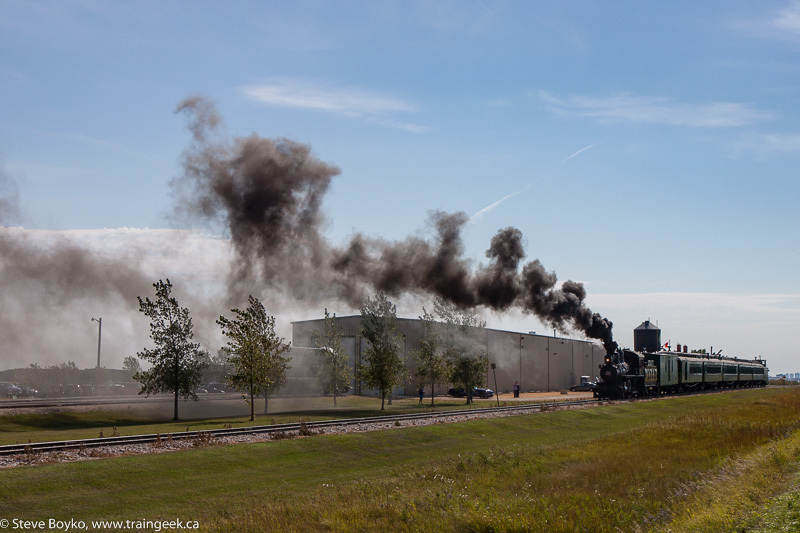 We photographed the two ex Virginia Central steam engines that are stored at the PDC (ex CP 1238 and 1246). These came to Winnipeg back in September 2015 and have remained at the PDC since. I don't know what the plans are for these locomotives. The PDC does not own them. You can see the freshly painted "genset car" #111 and ex BNSF 1685 in the row as well. PDC's main diesel, #4138, was sitting out at the other end of the shops. As 11 AM approached, people started lining up to board the train. Tickets indicate which car you are on and the seat you're assigned to. If you go to their ticket site you can pick which coach and which seat you want... assuming it isn't already taken. It's pretty slick! They used to link out to Ticketmaster but I see their ticketing is now fully integrated with their web site. Nice work. 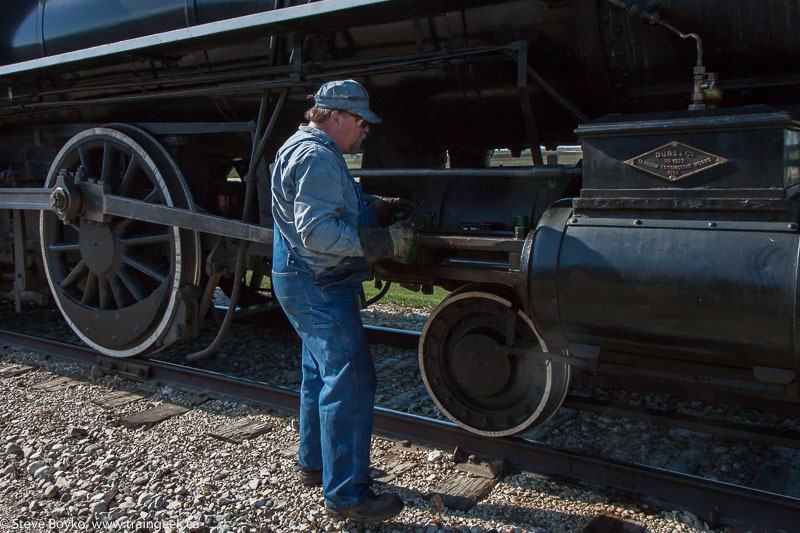 The crew did some final oiling of the locomotive before the trip to Grosse Isle. The platform was emptied as people found seats, and there were only a few stragglers left on the platform when we took our final shots before getting ready for the pursuit. They made some serious smoke before getting under way! We chased the train from the Inkster Junction station to the Perimeter Highway. 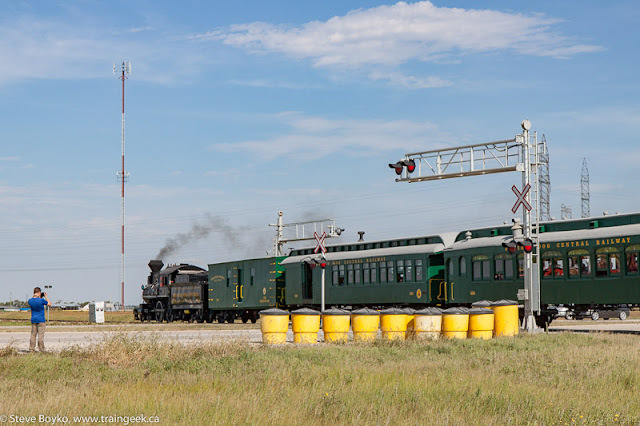 That's a short chase - 4.5 km (2.8 miles) - but there's a dirt road paralleling the track and the train doesn't go very fast, so we were able to stop three times to shoot the train. I elected to shoot video. Round 3 - I elected to shoot this at the Lilyfield spur. The track in front is the track CN uses to service the nearby Paterson grain elevator. Round 3.5 :) - we saw it was approaching the highway crossing and Michael wanted to catch it crossing there, so I stopped the car at the bend near the crossing and Michael jumped out to get the shot. I stayed by the car and photographed him photographing the train! That was it for us, as we had to get back to Diamond to get the VIA Rail Canadian. No rest for the wicked! 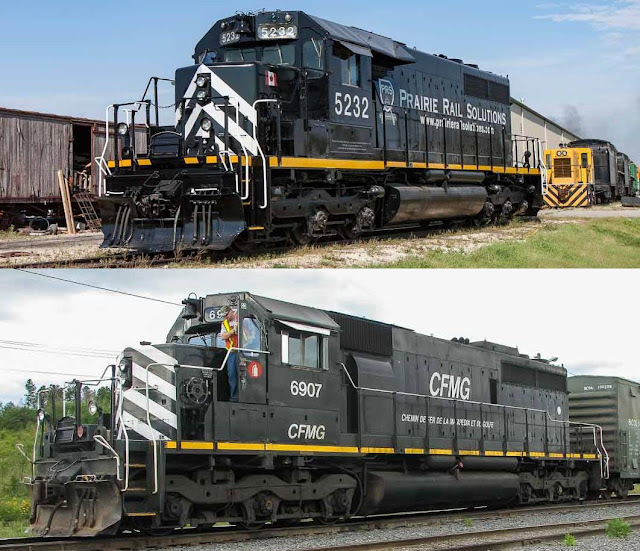 I'll wrap up this three-part series with a few CN trains at Diamond, along with VIA Rail's flagship Canadian, finally... with a little bonus action at the CN Symington hump yard. Hi Chris, yes, you need to get down this way for sure! The Prairie Dog Central used to operate out of St. James Junction and ran on the Oak Point subdivision - same as they do now, but farther south - and they would have run near Polo Park, west of St. James and east of route 90. Their recent history is here describing where they used to operate. I didn't live in Winnipeg before they relocated the station building but I rode the PDC (once) from there and as I recall it was north of Ness, closer to Ness than Silver. So yes, right across the street from Polo Park and south of the Winnipeg Arena and Stadium. Thanks for the details, Rick. I wasn't in Winnipeg when they were running from there so it is good to get some info from someone who rode it then!